Another basic yet essential component of the cartilage mass, as well as the ‘liquid magnet" is a chondroitin proteoglycan which allows the elasticity of tissues. Moreover, it facilitates the regeneration of the cartilage which has no circulatory system and blood vessels, thus it can only be nourished by means of the synovial fluid. A chondroitin deficiency causes the inadequate supply of the cartilage with the necessary components, thereby leading to the further damage and degeneration of the cells, unable to regenerate after all daily exertions. The basic mass of the cartilage loses flexibility and its shock absorption abilities are diminished. 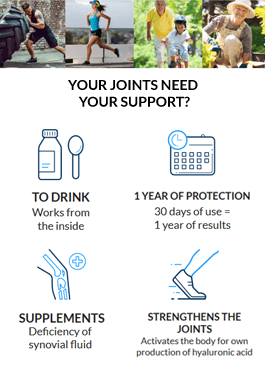 As an athlete I would like to remind how important supplementation is, in this case providing the body with an additional amount of hyaluronic acid which causes better joint lubrication and thus prevents arthralgia and joint degeneration. The chondroitin sulfate is another basic and essential component of the cartilage substance, serving as a ‘magnet for liquid" . Its strong negative charge as well as the efficient water- binding capacity guarantee the elasticity and structural integrity of the tissues. It also helps to regenerate the cartilage, since the cartilage does not contain blood vessels and it is nourished only through the synovial fluid. In fact, the chondroitin sulfate enables the absorption of the nutritious substances to the cartilage cells by means of the basic substance. Moreover, it protects it from losses and deficiencies, because it prevents the degeneration of the cartilage caused by particular enzymes. The lack of chondroitin leads to an inadequate replenishment of the cartilage, which results in damage and regeneration of the cartilage cells. Besides, the basic substance of the cartilage loses its elasticity and, thereby, its water-binding capacity. It is followed by the further degeneration of the articular cartilage and contributes to the occurrence and development of the osteoarthritis. The biological source of the chondroitin sulfate in HYALUTIDIN HC Aktiv is the cartilage of sharks. According to the recommendation of the European League Against Rheumatism and the Osteoarthritis research Society International (OARSI), the chondroitin provides medium strong up to strong relief of pain and an increase of the joint functionality. At the same time, it was proved that the effectiveness of chondroitin depends on the presence and concentration of the hyaluronic acid. its function as a magnet to liquids, facilitating the binding of the liquid to the proteoglycan molecules. A synovial fluid provides cushioning and acts as a spongy stabilizer and it also distributes the nutritious substances into the cartilage. The articular cartilage has no blood flow, therefore its nutrition and lubrication depends on the fluid that enters and leaves the cartilage when the pressure is exerted on the joint. The chondroitin sulfate is a sulfated glycosaminoglycan (GAG) consisting of a chain of alternations sugars ( N-acetylgalactosamine and glucuronic acid) od the molecular weight ranging from 10 to 50kDa. The chondroitin sulfate chains are the unbranched polysaccharides of the variable length. Along with glucosamine, the chondroitin sulfate became the commonly used dietary supplement in the treatment of osteoarthritis.